You spend your best time with your family in your pool, even if it is only you trying to spend some time alone or on fitness, you prefer to get a dive into the pool. However, the pool in your backyard or even in the front garden, one thing which is very tough to deal with is maintaining a clean pool that could be used in routine for effective use. So, here we bring you some important factors which you have to focus when you plan to work on Pool Cleaning Service in Boca Raton. Clean the filters: The first step to work on pool cleaning is to ensure that there is no debris or leaves in your pool. Make sure you remove each and every outside factor that could block the filters. Moreover, you can also clean the filters by brushing them off from any deposited dirt and clogged debris keeping it under water for a few minutes. Add Chemicals: The next move is to fill your pool with fresh water without removing the existing water. You can simply turn on all the equipment which is needed to be used for filtering and adding chemicals. Make sure you are informed about the right amount of chlorine shock needed to work on your pool cleaning. Balance pH: When you leave your pool to stay under the action of running water and the chlorine for around 24 hours or more than that, you should aim to check the water to be perfect for swimming. You should ensure that the chlorine level in the pool should be 1-3 ppm, ph should be 7.4-7.6, while calcium and alkalinity with 200-400 and 80-140 respectively. Monitoring: The next immediate move to advance pool cleaning is to monitor the pool to check the functioning of the filter as well as the color of water. Make sure nothing should obstruct the way of the filter because it could interrupt the functioning of the system. When the color of the water, as well as its chemical composition, starts to look stable, you are all set with your pool. Skimming: The last part of pool cleaning is to aim for pool cleaning is to focus on the skimming of the pool using the vacuum and the scrub. As we are close to the winters, we can still have a quality time in the pool using a solar cover that could help to warm the water and keep the pool protecting it from any Pool remodeling in Boca Raton. 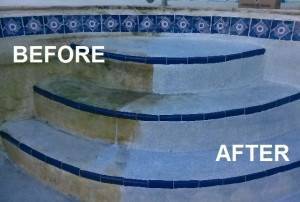 Romance Pools offers pool services in South Florida with best in class cleaning, repair, and remodeling assistance. Contact us for a quick visit! Romance Pools © 2017 All Rights Reserved. Developed by DOA Web Design.